It's great when there's a day of cool weather in the mix of a hot streak. The first thing I did? Jumped into the kitchen and baked cookies!! Caramel Stuffed Snickerdoodles to be exact...I didn't want to go to the store for anything and I just happened to have all the ingredients in my cupboard. Which was great since I had family coming over for dinner. 1. Combine flour, cream of tartar, baking soda, 1 tsp cinnamon and salt together in a bowl. Set aside. 2. In a separate bowl, combine melted butter, 1 C granulated sugar, and brown sugar until smooth. Whisk in the egg and vanilla, combine well. 4. Unwrap caramels and cut into 4 pieces. Remove dough from fridge and roll into 1 TB balls. 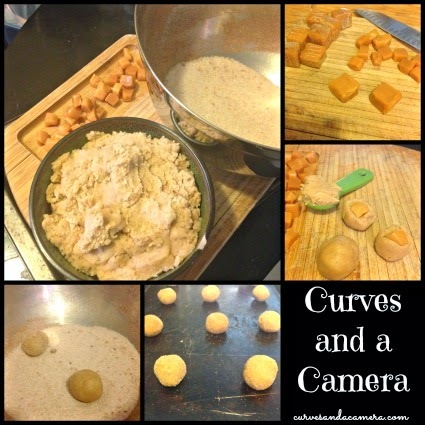 Cut/break apart balls and place 2 pieces of caramel into the center and reform the balls. 5. In small bowl combine 1/4 C granulated sugar and 1 tsp cinnamon. Toss dough balls in cinnamon/sugar mix. 6. Bake on lined cookie sheets for 10-11 minutes each. Let cool completely before enjoying (the caramel will get very hot inside).